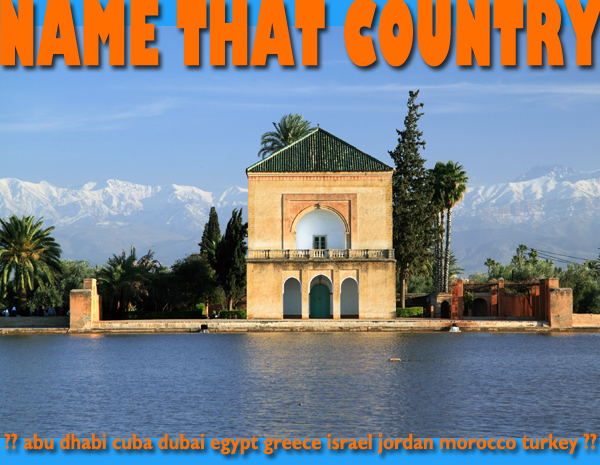 The artificial lake above is supplied by the wall of Atlas Mountains in the background and has been watering the surrounding groves of palm, olive and fruit trees, known as the Menara Gardens, since the 12 century. The elegant 19th-century pavilion is used for picnicking and gazing out over the lake and gardens. A shady, tranquil sanctuary from the summertime swelter and crush of the Red City, the gardens attract tourists and locals alike. The blue men of the Sahara get their name from the blue robes and scarves that they traditionally wear. They are Tuareg, an ethnic group of the native Amazigh or Berber. About 2 million Tuareg live in the Sahara region today. The largest populations are in Niger and Mali, with a relatively small number in our mystery country. The Tuareg are traditionally semi-nomadic traders, moving goods across the Sahara Desert to Mediterranean and Atlantic ports. They also carried enslaved people from West Africa to coastal markets and kept slaves themselves well into the 20th century. Slavery is still practiced in some communities. Tuareg society is matrilineal and women generally have more autonomy and power relative to other Arab communities. Traditionally, Tuareg men veil their faces and women do not. 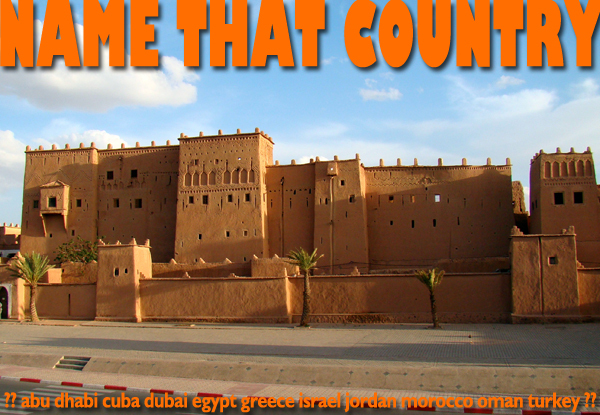 This is Kasbah Taourirt in Ouarzazate, a Sahara Desert gateway town in the center-south of our mystery country. Taourirt was built in the 19th century by the Glaoui, a ruling clan of the south. UNESCO has restored the palace section of the kasbah and it is open to tourists. The Kasbah was a small fortified village, with multiple single-family dwellings inside, as well as the palace, and several families still live there. 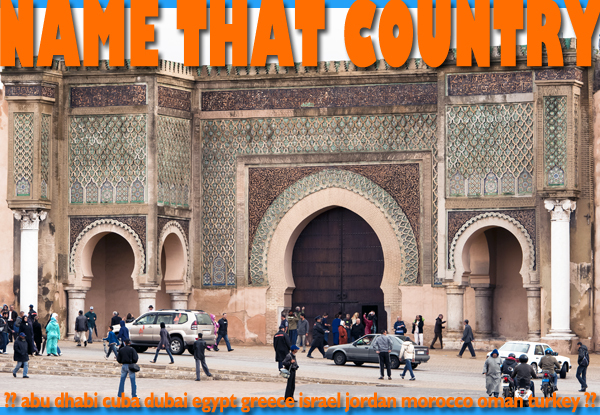 The former Imperial City of Meknes is in the north of our mystery country. Meknes was the seat of the ruling Alaouite Dynasty from the late 17th century to the early 19th century. The dynasty’s founder Sultan Moulay Ismail vowed to make his city rival Versailles and by most accounts succeeded. Some of that grandeur remains, including the glorious Bab el-Mansour gate pictured above. One of the country’s top tourist attractions, the Roman site of Volubilis, is about 30 minutes away from Meknes. 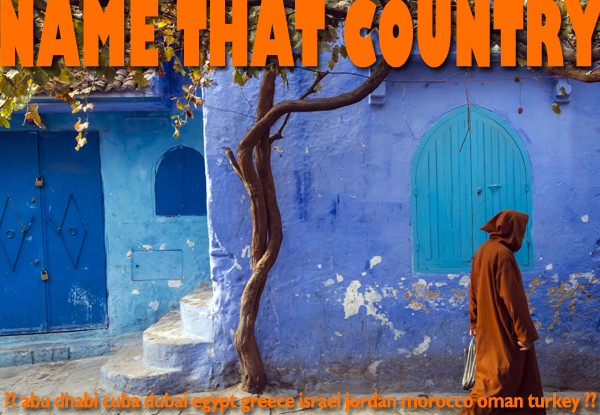 The “blue city” of Chefchaouen is a meditation on the divine, often represented by the color blue in Jewish tradition.The village was founded in 1471 by Jews and Muslims fleeing the Spanish Reconquest. Jews also fled here prior to World War II, but most left upon the founding of Israel in 1948. Chefchaouen is tucked into the Rif Mountains in the northwest of our mystery country, a compact maze of narrow lanes framed by crisp blue and white Andalusian architecture. Although it’s several hours from the population centers and tourist hubs of the country, more and more visitors are making the trek to experience the crisp air and relatively low-key charms of this mountain jewel. The cultural hub of one of our mystery country’s most famous cities is pictured above. Jemaa el Fna square is known for its manic atmosphere, especially after the sun sets. Locals and visitors come here to see traditional musicians, dancers and story tellers and enjoy fresh squeezed juice and a hot meal from the many food stalls. 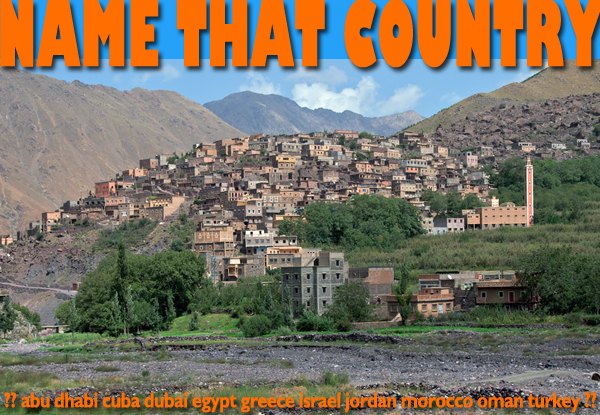 The village of Imlil is tucked into the High Atlas Mountains. Trekkers use Imlil as a base for climbing Mt. Toubkal, the highest peak in North Africa. However, you needn’t be a mountain climber to enjoy the crisp air, soaring views and traditional charms of this Berber village. 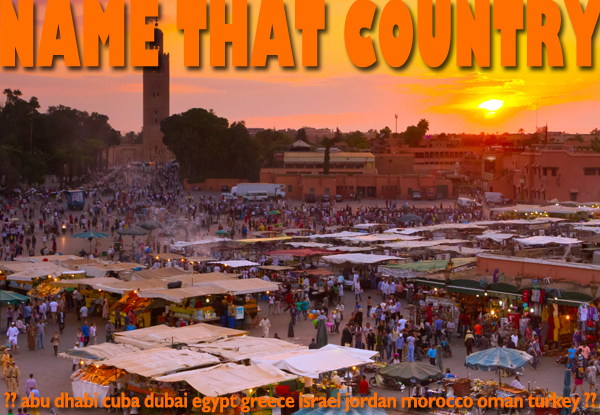 It makes a great day trip from Marrakech, only 90 minutes away.